Wipe everything down with disinfectant to kill/remove the mold. Take off the chassis and remove all traces of the spider colony that had once taken up residence there. (Sorry, I didn’t take photos!) Blow the whole thing out with a few blasts of canned air. Clean the volume potentiometer with some spray cleaner/lubricant. Tighten all the fittings (e.g., the pot and some jacks were loose). Solder the terminal strip connections that were just bare wire. Add a grounded, three-prong power cable and fuse. This shouldn’t actually affect the sound, but seems to be a common safety modification. Older amps just used two-prong cables, which can be dangerous if you plug it in backwards, or if the circuit frizted you might end up with 120 volts shooting across your guitar strings. Ouch. 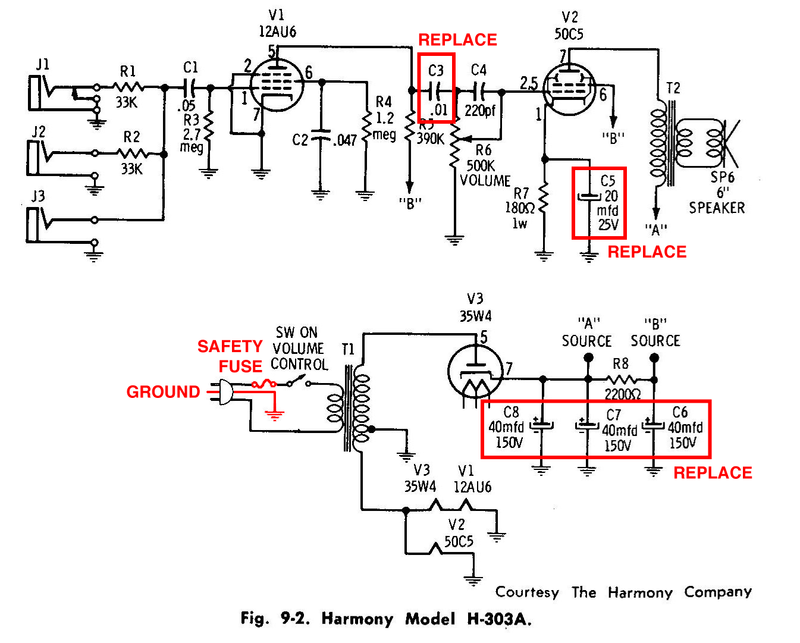 Properly grounding the circuit and adding a fuse makes it safer. Replace the electrolytic capacitors. In particular, the filter capacitors, which function like little batteries to help smooth out current from the power supply section. Supposedly, these need to be changed every 20 years on tube amps, and are often to blame for an old amp’s quietness or hum. It looked like the Harmony’s caps were still original stock. Replace the tubes. Tubes can get old, although this particular amp uses a rare oddball trio that is hard to find (12AU6, 50C5, 35W4). Replace the speaker. Speakers get old too, however, the 1950s “Jensen Special Edition” speaker in this amp still seems to be in demand among gearheads (at least, they go for $50+ on eBay). My friend Trevor Baker of TRVR Handwired repairs and builds custom amps for a living (e.g., St Vincent uses his amps in her recording studio). So I shot him an email. He suggested that I start with the cable, fuse, and capacitors, and if I’m still not happy I could look at replacing the tubes and/or speaker. He sold me $35 worth of components and mounting hardware from his supply and gave me a 30-minute crash course with more details on what to do next. Between his help and this Instructable (on fixing an old Kay amp, although most of it still applies), I was ready to start rebuilding. I had to drill out the hole for the new larger power cable and make a new hole for the fuse holder (both 1/2 inch). The power cable is actually from an unused MacBook power adaptor I had lying around; the white cord looks really nice with the white-on-blue graphic design on the outer panel. One tricky thing was replacing the filter caps: they originally came in a “can” that stuffed all three capacitors into a single shielded cylinder sticking up out the back. I left the can where it is for looks, but it isn’t actually connected to anything. Instead, I just mounted three new capacitors on terminal strips underneath it. All in all, this was a fun little surprise project. I cost me $60 total, plus about 3 hours of research and 2-3 hours in bench time one Saturday afternoon (mostly spent triple-checking every step to make sure I understood it before doing it). Once it was done, Trevor gave it a listen and said it wouldn’t be too hard to overhaul the circuit with more powerful tubes… giving it more volume and more of a Fender Champ type sound. I think I’ll leave it as-is for now, although I might still replace the tubes to see if that makes it sound any smoother (another $30 or so). For the time being, it suits my needs as a practice/workbench amp, and I suspect it will be great for recording since it gets nice, warm distortion at low volumes that won’t clip the microphone. (That’s been a bit of a headache with my 30 watt Peavey; it doesn’t have the greatest tone at low volumes.) Besides, modding the Harmony to make it more powerful would require a new transformer, and I’m not super-comfortable working with higher voltages yet, anyway. New rectifier tube 35W4 (more volts) and a new output tube 50C5 will definitely help to produce more watts, I’ve got 3,5w rms out of mine, also you can try different 12AU6 tube brands for various tones. Hi, can’t see too well when you replaced the 3 40 mfd caps. Have a harmony H303a that needs the new caps like yours. The can cap needs changing. Don’t want to get rid of so how and where did you hook up the new caps. Have 3 40mfd x 160 volt caps coming. It’s hard to see your picture of the 3 you replaced.